Few arguments in biology have been more fierce, or more long-lasting, than the nature vs. nurture debate. 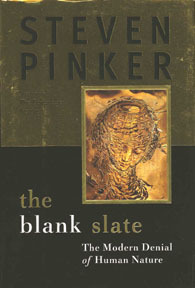 In The Blank Slate, MIT psychology professor Steven Pinker jumps into the fray. Hardly an objective observer, Pinker makes little attempt to evaluate both sides of this issue — he is an unabashed nature supporter. He frames his account of this still acrimonious dispute in the terms of evolutionary psychology (a now-respectable descendant of E.O.Wilsons once controversial sociobiology): Is the mind initially blank, only written on after birth by experience, or does it also contain lessons already written by ancient genes? This is a bit of a straw man, phrased in this blunt either-or way. It has been clear for a long time that major aspects of human personality and intelligence are influenced by genes in important ways. Major studies of identical twins indicate heribilities approaching 80% for major personality traits. Noam Chomskys theory of universal grammar tells us that the basic grammar of language lies embedded in genetically determined brain structures, which form the syntax of our words and thoughts. The real fight is not over whether nature plays a role, but over how much. For a given trait, how much can be attributed to genes and how much to environment? This is not a simple question, and Pinkers simple answers do little to advance our understanding — but hes an entertaining writer, and it sure is a lot of fun to listen to him rant.